Since the book came out I've been getting a few questions about Piglet, our crazy little feline companion. I thought it might be a good time to do a formal introduction. Piglet is a Sphynx cat, like the cat who played Mr. Bigglesworth in the Austin Powers movies. More often they are referred to as hairless cats, but that isn't entirely accurate. 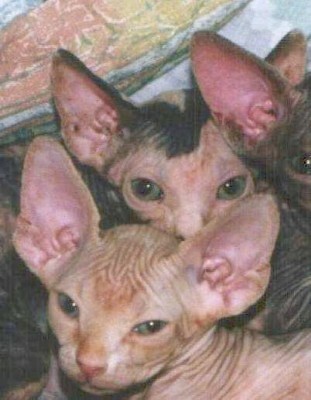 Sphynxes have a fine, soft, downy coat which make them feel like a warm peach or like suede. Also, Piglet is a calico which is why she is blotchy. Sphynx cats can come in any color regular cat color but the patterns and pigments appear on their skin. Piglet joined our family in 2001 when she was only 13 weeks old. When we got her she only weighed 2 pounds! Now she is nearly 13 years old and a normal cat size. Her birthday is April 29th if you want to put that on your calendar. Piglet is the one in the middle peeking out. In case you're wondering, we named her Piglet because she looked like a little baby pig when she was a kitten. Piglet also leads to the nicknames of Piggy and Pig. In the time we've owned Piglet we have moved about 5 times, not including her initial trip to come live with us. She really enjoys rides in the car and we often take her with us if we are traveling to see family. Piglet is extremely friendly with people. She always wants to check out everything that is going on. However, she wants these interactions to be on her terms. She doesn't like to be picked up and she gets easily overstimulated with lots of petting. She also doesn't like other animals. Piglet's favorite person in the whole world is Matt. She also really loves food and warm blankets. We designed several parts of our tiny house to be accommodating for Piglet. We couldn't imagine a life where she couldn't get up to the loft so when she initially rejected the ladder, we built the platforms above the sofa. She has since learned to navigate the ladder to go up but she still won't use it to go back down so the platforms are still very much in play. We also built in a spot for her litter box in the house to keep it accessible for her and out of sight for us. For an older cat, Piglet is still very active. You wouldn't know that she is nearly 13. She loves to play with toys on strings and sometimes just runs all around the tiny house and up and down the platforms. While I've certainly written about Piglet a few times on this blog, I don't know if she has ever been formally introduced. So if you were wondering what that weird little cat was in these photos, now you've had an opportunity to meet Piglet. Howdy Piglet! Nice to finally be introduced! She is certainly one of the most unique felines I've ever seen. I never lived without a cat, so when I moved into my first bachelor apartment, I made a trip to the local animal shelter almost immediately. We got a Calico domestic shorthair named Midori. Unfortunately she likes neither car trips or other people. She too is now almost 13 (December 30th). She was three when we got her from the humane society, and was given up with full papers and the name "Baby Kitty". I think her previous owners got her for some small children and then wanted to get rid of her when she was no longer a cute kitten. That made me sad and she came right home with me. Just recently we took her to the vet for boarding as we were going out of town for the weekend, and felt so ashamed with the way she hissed and growled at the tech. I don't think the tech believed that Midori is the sweetest cat in the world as long as it's just her, me and my wife. I remember her from years ago on a cat forum... I think Acme? Now I get to see her in your tiny house. Amazing how these little guys brighten our lives! I've got tow little Yuppie fuzz-balls myself. Amazing how these little guy brighten our lives! I've got two little Yuppie Fuzz-Balls myself. Love it! She's beautiful. My home just isn't a home without my cats! Your Piglet reminds me of my Oliver. He was born April 23, 1999 and you'd never know that he's 15! He's super loving, but on *his* terms. Sometimes he acts more like a dog than a cat (like when he greets us at the front door when we come home and meows at us as if to ask, "Where have you been all day? Why did you leave me alone?"). I can't imagine life without him!